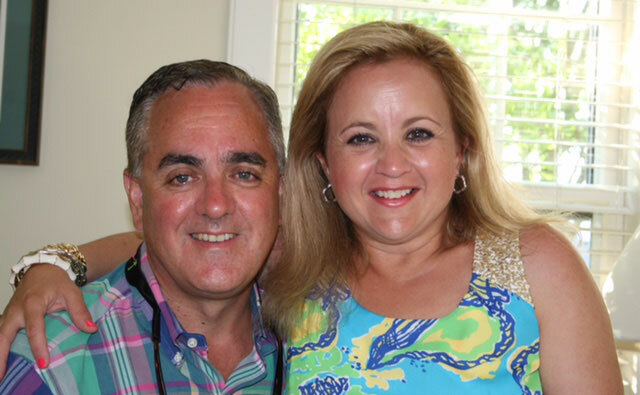 Amy Gallagher and husband Robert Gallagher support research and patient care for people with brain cancers. After a daunting diagnosis, a successful businesswoman draws on her background to create a foundation to support patients as well as research. When Amy Gallagher was diagnosed with brain cancer in 2014, it only took her a few minutes to decide how she’d deal with the news. “I’m not going to let a little tumor take me down,” she told her husband, then began working to improve the lives of others while receiving treatment at the Massachusetts General Hospital Cancer Center. Ms. Gallagher, who lives in Jamestown, Rhode Island, is a high-achiever who consistently accomplishes what she sets out to do. At age 47, she had reached a new level of success in her marketing and sales career and was proud to have enrolled her two daughters in a private school in nearby Newport, Rhode Island. She met the challenge of her cancer diagnosis with the same energy. “I was determined that I was going to live my life,” she says. Ms. Gallagher began treatment for glioblastoma, the most aggressive and deadliest form of brain cancer. She was seen by a team at the Mass General Cancer Center, including Jorg Dietrich, MD, PhD, clinical director of the Cancer and Neurotoxicity Clinic and Brain Repair Research Program. Dr. Dietrich concluded that surgery was not possible. The tumor was large and deep-seated, and even partial removal would risk causing significant problems with brain function. “In Amy’s situation, we had to think differently because the tumor was inoperable and there was a large amount of swelling in her brain,” Dr. Dietrich says. So he asked Ms. Gallagher if she’d consider a drug called Avastin in addition to the usual chemotherapy and radiation therapy. Avastin is FDA-approved for recurrent cancer, but some doctors add it to initial treatment in the hopes that it will control the disease and improve a patient’s quality of life. “I put my trust in Mass General and had no doubts about doing it,” she says. Against the odds, her tumor started to shrink — and right away. “It exceeded my own expectations — the anatomy of the brain almost normalized,” Dr. Dietrich says. The drug combination Ms. Gallagher was receiving continued to shrink her tumor to a point where there was no convincing evidence of any residual tumor. Before getting sick, Ms. Gallagher was constantly on the go. But due to her condition’s debilitating symptoms — exhaustion, weakness on the right side of her body, and trouble with speech — and her intensive treatment regimen, she had to give up her career. A year into her treatment, however, she was restless. Drawing on her MBA and her marketing, communication and sales experience in the healthcare field, she established the Amy Gallagher Foundation in 2015. The organization’s mission is to improve survival for brain cancer patients by funding hospital-based research. It also provides financial support directly to patients who don’t have health insurance or who need assistance with hospital bills. Ms. Gallagher wasted no time galvanizing dozens of volunteers. They helped her organize several fundraisers, including a gala in Providence, Rhode Island, called “Illuminations,” featuring Dr. Dietrich as the keynote speaker. Many sponsors and attendees were from Ms. Gallagher’s wide network of former clients and coworkers, who were drawn to her dedication to the cause. The Amy Gallagher Foundation had a very successful year in 2016. In addition to raising money to directly support patients, the foundation was able to donate $50,000 to support Dr. Dietrich’s research into more effective and safer treatments for patients with brain tumors. Now, Ms. Gallagher gets an MRI every two to three months to track her progress while continuing her therapy. She finds her symptoms “manageable” on most days. She’s looking forward to this year’s Illuminations event, May 11 at the Providence Biltmore, and she’s planning a 50th birthday trip to Napa, California. She feels energized by how the foundation has taken on a life of its own; it’s become a way to connect people affected by brain cancer and give hope to those with this challenging diagnosis. “I feel like everything I did in my life led here, and that I’m supposed to be doing this,” she says. For more information on glioblastoma treatment and research or to make a donation, please contact us. Join the search for breakthrough discoveries that will change the face of medicine.